Liberatchik is an art movement devoted to Liberty. We are conservatives and libertarians who understand the power of art. We know it has the power to move people with its intrinsic value, but it also has the power to gather people into movements for a cause. That is our focus. This month, we're highlighting Michele Bledsoe and the Resurgence of Classic Children's Stories. Much of what I have learned about Michele and her art has come from her writings and stories. I was interested to know that she became an artist at a young age, much as I did myself. In much the same way that I came to an early love of art and a desire to draw, Michele was inspired by the children's books of her youth. Michele Bledsoe is a self-taught painter; but she didn't start her creative career with brush in hand. In fact, she came to the art of painting as a means to deal with the grief she felt at her father's death. In My Easel and I: A Love Story, you learn about the touching expression of her father's love and his desire to give her something that would last forever – a metal easel. Though she had previously brought her imagination to life with drawing instruments and whatever paper was available when inspiration struck, her father's passing and the easel he bestowed upon her put Michele on a path to self-discovery and broader creative purpose. Michele's stories are beautiful and touching in their sweetness and emotional depth. Though The Return of Boo Radley is my personal favorite, I find myself moved by the eloquence within all of her stories. There is a little bit of Michele in each one and she has a penchant for making the reader feel as if they were a participant in each story. Vivid images of embellished pine cones and whimsical creatures spring to life in the reader's imagination as her stories unfold. It seems quite logical that Michele would eventually decide to create her very own children's book, though the path she took to launch the project was not traveled in the typical way. I suspect that much of what Michele does is not typical, so it is quite fitting that her art literally came before the idea to create the book. In fact, her sister is the person who opened her eyes to the fact that the book was already written; on the walls of her own studio that are covered with her small but vibrant images. Michele has had some surprising revelations along her creative path. The most important discovery she has made was the distinction between message-driven stories and books destined to become classics of lasting cultural impact. This is a rare distinction in our modern, instant gratification society. Michele found that books designed to inspire are beautiful and imaginative, subtle and creative, transcending cultural trends and pop imagery. The result is The Secret Kingdom, a collaborative book of art and poetry between Michele and her husband Richard. This beautifully written and creatively illustrated book provides an artist's glimpse into the worlds of dream and imagination lost in much of modern pop culture. It is sure to inspire current and future generations of children to embrace the creative rumblings of their own minds and cultivate lasting beauty and inspiration for years to come. Our October artist, Betty Taylor, is one of our talented painters. 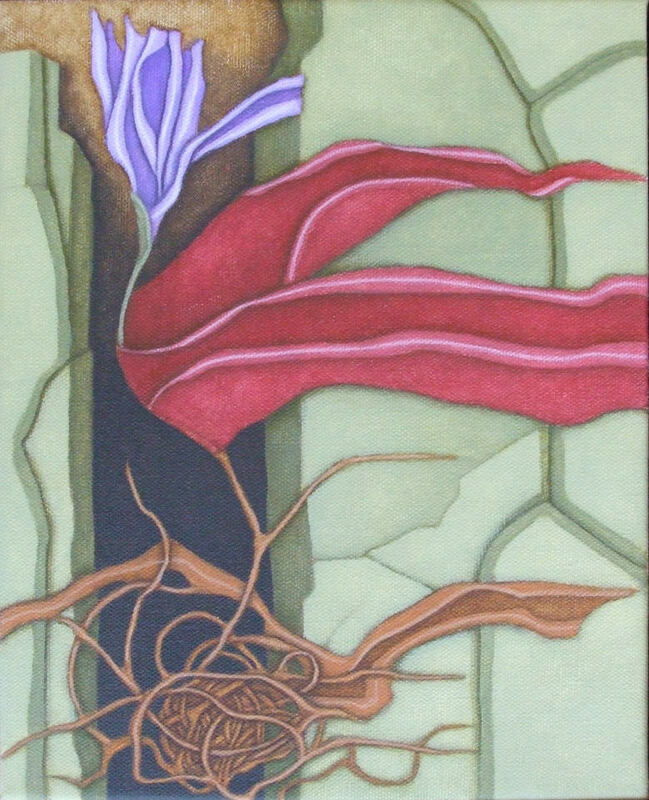 All of her work is vibrant and expressive, conveying beauty in texture and color, regardless of subject. Though more of a traditional artist, Betty is beginning to branch out to create more conceptual and editorial pieces. We are excited for her new direction and look forward to seeing where she goes with her new inspiration. We've been working hard to break down political barriers in the art world. This month at Liberatchik, we're featuring the work of folk artist Kathy Graybill. Kathy has been one of the most directly inspirational artists I have met over the years. Her beautiful and complex body of work has motivated me to pursue an artistic avenue that I previously thought impractical – hand painted furniture and primitives. This summer, I drove down to Atlanta for the 21st annual Folk Fest. Kathy and her husband were there with a wide array of their painted signs and furniture. Seeing an entire booth of her beautiful work was intimidating and overwhelming – but also inspiring. I can’t even begin to imagine the number of hours invested in the layering of the paints and glazes applied to the pieces.